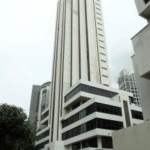 Catering to demand: The top three floors of the 24-storey Tung Centre at Collyer Quay were recently sold for $63.6 million, or $2,180 psf, by a foreign bank . 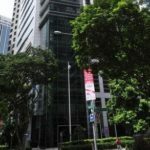 [SINGAPORE] Some $1.1 billion of strata office properties were transacted in the first five months of this year, just shy of the $1.3 billion for the whole of last year, driven largely by liquidity, investors switching out of the residential sector, and developers minting strata offices in new projects to cater to strong demand. 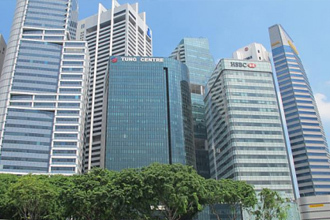 CBRE’s analysis of caveats for strata office space lodged with the SISV Realink and URA Realis databases shows that Paya Lebar Square had the highest strata office sales in the first five months of this year, with $322.3 million of deals. 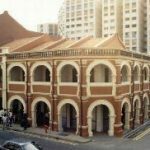 It was followed by The Adelphi, a 999-year leasehold completed office-and-retail complex near City Hall MRT Station, at $94.3 million, or an average price of $1,893 per square foot. Another completed development, Burlington Square at Bencoolen Street, was in third spot, with $89.3 million and averaging $1,318 psf. Burlington Square is on a site with a remaining lease tenure of about 83 years. 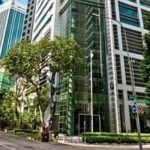 Strata offices in three new projects in the Tanjong Pagar, Robinson Road and Shenton Way area locations also featured in the caveats analysis this year – Far East Organization’s PS100 at Peck Seah Street, with $83.6 million of caveats lodged, reflecting an average price of $3,070 psf; Eon Shenton with $67.3 million; and Oxley Tower, at $42.8 million or $3,180 psf. Activity in the strata office market began to pick up in the second half of 2011, and the trend has continued in the first half of this year, notes CBRE’s executive director (investment properties), Jeremy Lake. Buying interest could strengthen further as the fundamentals which have supported the sector – notably, low interest rates and high entry barriers in the residential sector – are now complemented by positive sentiment for this asset class, he explains. 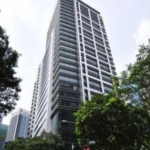 Market watchers, such as Savills Singapore research head Alan Cheong, say that much like the residential sector, demand for strata offices has been spurred by supply.  Developers have been minting new strata offices in projects such as Paya Lebar Square, Oxley Tower, Robinson Square and Eon Shenton. 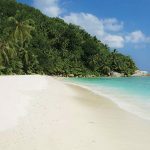 “Because interest rates have been low for a prolonged period and inflation has set in, money has lost its value. Investors are increasingly drawn to an alternative currency: real estate,” says Mr Cheong. In the pipeline is the redevelopment of KeyPoint in the Beach Road area and Tower 15 at Hoe Chiang Road, which could generate a fresh supply of strata offices in the primary (or developer sales) market. Investors are also awaiting the launch of Far East Organization’s The Index at Cecil Street/Robinson Road, next to Capital Tower. Meanwhile, on the secondary market, completed developments continue to cater to demand for strata offices, especially by occupiers looking for their own premises to enjoy greater rental stability and with an eye on capital appreciation. Suntec City remains a favourite pick. The top three floors of the 24-storey Tung Centre at Collyer Quay were recently sold for $63.6 million, or $2,180 psf, by a foreign bank. The 29,159 sq ft vacant space is on 99-year leasehold tenure starting March 1985. The buyer is thought to be a Hong Kong group in the resources sector involved in copper mining. It is expanding its presence here and will occupy one floor and lease out the other two. Mainland Chinese parties have also been buying offices for their own occupation, say agents. Some buyers have been picking up individual units from investors who had earlier made bulk purchases. An example is the Guthrie-Sun Venture tie-up, which bought 86 office units and 77 retail units at The Adelphi in January last year. Since then, it has resold all the office units and some of the shops. 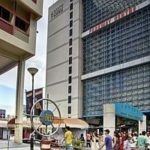 Last month, the duo teamed up again to buy all 66 office units in Burlington Square and have indicated that they are open to selling the units “if attractive offers come along”. 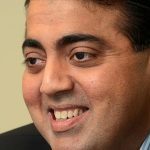 A few months ago, a consortium led by real estate investor Kishore Buxani acquired 51 office units totalling 51,191 sq ft at Parkway Centre in Marine Parade for $53.4 million or about $1,043 psf. The consortium is expected to begin marketing the units for sale soon on an individual basis.